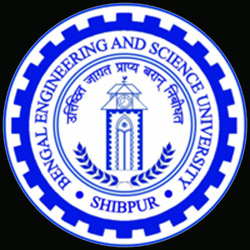 (Left) The logo of Bengal Engineering and Science University, Shibpur, West Bengal. 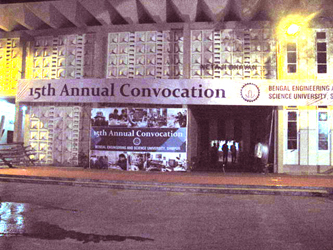 (Right) The entrance to the 15th Annual Convocation. at the Parliament of Religions, Chicago, Illinois. 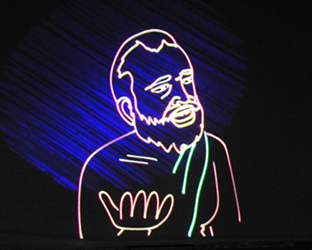 January 19, 2013: “Swamiji” , the laser documentary on Swami Vivekananda is a hit again! “We have been waiting for this show, and it is absolutely spell-bounding“, said Dr. Ajoy Kumar Ray, Vice Chancellor, BESU, “you are indeed a laser-magician!” The show took place at the same stage where the 15th Annual Convocation took place earlier, attended by Shri Pranab Mukherjee, the honorable President of India. The custom-made stage built to MSP’s specifications was large enough to hold the entire show without any problems including suspending the massive 40’W x 14’H laser screen. It was attended by a packed audience of over 3500 people. Prior to the show, Manick Sorcar was felicitated on stage by BESU. At the end of the show a delighted Dr. Biman Bandyopadhya, the Registrar of BESU, came on the stage and asked the audience to join him to thank Manick for the “magnificent show”. He also announced the show was going to be repeated the next day, January 20, to meet the demand. Srijan Bhattacharyya: Manickda, we are proud of you!!! 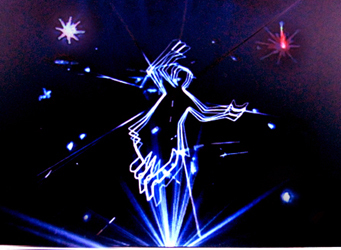 Saantanu Atta: the awesome laser show..in first time of my life..! !hat's off to manick sorcar...!!! Prasenjit Chaudhuri: I LIKED YOUR LASER SHOW ON SWAMI VIVEKANANDA VERY MUCH.I completely got connected with it.I COULD FEEL EMOTIONALLY THINGS THAT MOULDED SWAMIJI.THANKS FOR CONVEYING HIS GREAT LIFE TO US IN GIST. 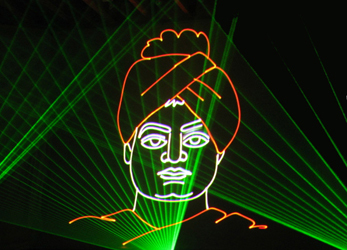 Avishek Pal: Thanks for your yesterday's fabulous laser show about Swami Vivekananda at BESU campus.I've really enjoyed and loved it.I'm proud of being a spectator of this incredible show. Gragi Biswas: first of all thank you a lot sir for such an awesome laser documentary..got to know many things about swamiji...it was such a pleasure witnessing your show...hoping to see you agn in our campuss. Nabin Chaudhury: thanks a lot for giving me the oppurtunity to enjoy the latest technology of laser beam. Honestly i have really enjoyed it. To observ ur show i have become ur die hard fan. It seems to me that u should definitely do this. Because normally people does not show any intention about the principle of swamiji's undefeated ideas and thoughts. But ur interesting latest technology work as oil in machine and will become the medium of inspiration. Then people will obey to think about this greatest famous personality.